This naan bread recipe makes the perfect accompaniment to any Indian dish and I particularly like it with Tandoori Chicken but you can just use it to dip in some Raita. It's become fairly standard to serve naan with Indian food however the origins of naan are Persian (what we now call Iran) and really the word is generic for any type of flatbread. There are more well defined flat breads such as pita in Greek and turkish cuisine as well as chapatti in Indian and Bangladeshi cuisine and with these and many other exceptions, naan would appear to be a "catch all". That said, it's still a great accompaniment to many a meal and perfect for cooking on the barbecue. I've chosen to cook mine on the ceramic heat deflector in my kamado (it was in the early days of my kamado cooking experience) but now it's just not clean enough. The best is to set up for indirect cooking ie have the heat deflector stones in position and use a pizza stone sited on the cooking grate. 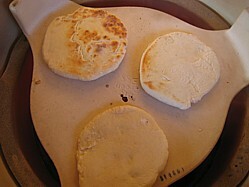 Note: You can cook naan bread directly will need a high heat and also more turning of the bread to avoid burning. If you have a kamado with split heat deflector stones then by using just one side of the stone you'll be able to use the combination of direct and indirect heat. Turn them over every 1-2 minutes and you'll have some great tasting naan bread. Mix the butter into the flour with your finger tips, add the sugar, salt and dried yeast and pour in the warm milk. Kneed well and then gently add the yogurt, continue to kneed until the dough has formed well. You’ll know when you’ve reached this stage because the bowl will be clean. If the consistency is too wet then add a little flour and if too dry, add a small amount of milk. Cover the bowl with stretch wrap and put the dough aside in a warmish environment for 2-3 hours. After it has risen, knock it back by kneading again for 2-3 minutes and then leave until ready to use. To prepare your kamado for cooking bread, make sure that your firebox is cleaned out and always use fresh charcoal, that way you won't get any unwanted flavours in the bread such as the residue of wood chips from from a previous smoke. Get your kamado up to about 480°F or 250°C and when ready, divide into six portions and roll out, stretching as appropriate to make the traditional Indian triangular shape of a naan. Cook for 10 minutes (turn them over after 5 minutes) and you’ll have the perfect home made bread to accompany your curry or kebab.